Valentine's Day is coming up, and I felt inspired by all the pinkness going on to do a pink eye too! But I didn't want to do a pastel pink out-on-a-date kind of eye look, because I didn't actually want to make Valentine's Day all about dates and guys and flowers and that kind of sterotypical stuff, you know? I wanted to give my Valentine's Day eye look a bit of an attitude, so I gave it a bit of an attitude by making it hot pink! For this look, I used shadows from my recently acquired BeautyUK eyeshadow palette, No. 6 Night and Day, which I previously blogged about. 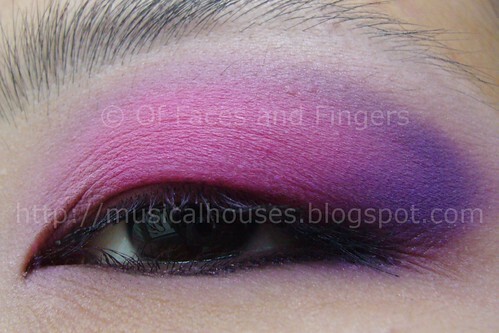 I previously said that I wanted to use the bright shades for an eye look, and Valentine's Day is the perfect excuse! I used the two pink shades, the violet purple shade, as well as the shimmery white shade for a highlight. 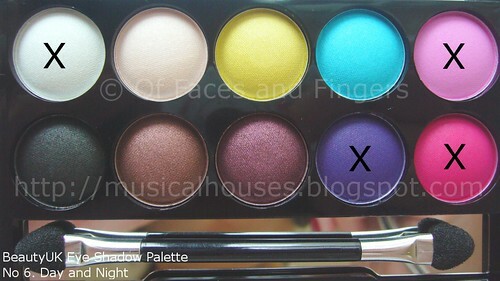 The shadows I used are marked with an X.
I used the shimmery white shade as a highlight, the light pink shade in the inner third of the eye, the hot pink shade in the middle third of the lid, and the deep purple shade in the outer third, and blended just a little into the crease. I was surprised how the shadow were actually very pigmented on the eye, and blended very well with not too much fallout. The photos speak for themselves. I doubt anyone would want to wear a hot pink shade on an actual Valentine's Day date, so this look isn't quite date-appropriate, unless you're the kind of girl who wears hot pink shadow regularly anyway. 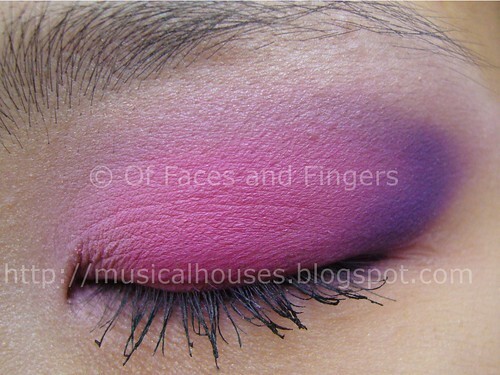 But this EOTD (eye of the day) can be made appropriate by replacing the hot pink shade with a pastel pink, and viola! Pastel pink and purple eye, all date-ready! But for all my girls who aren't going on dates (and why should Valentine's Day be only about dates, anyway? ), this is a great chance to get away with a pop of pink. This looks lovely! Nice combination of colours. Um, please do more bright looks like this more often, because they're AWESOME :D your blending is epic! This is sooo gorgeous. I love pink eyeshadow! nice slides, how do you get that? gorgeous, those are my go to colors everyday! @juuuunn: The slider actually came as part of the design. I got myblog design from btemplates.com, and you have to edit it a little for the posts to show up. Hope this answers your question!